Brazil: 14 confirmed Chagas disease cases after a family drank the juice of the bacaba, a type of palm tree from the Amazon. Chagas disease, or American trypanosomiasis, is caused by the parasite Trypanosoma cruzi. Infection is most commonly acquired through contact with the feces of an infected triatomine bug (or “kissing bug”), a blood-sucking insect that feeds on humans and animals. 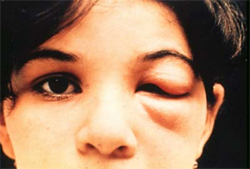 Chagas disease has an acute and a chronic phase. If untreated, infection is lifelong. Acute Chagas disease occurs immediately after infection, may last up to a few weeks or months, and parasites may be found in the circulating blood. Infection may be mild or asymptomatic. There may be fever or swelling around the site of inoculation (where the parasite entered into the skin or mucous membrane). Rarely, acute infection may result in severe inflammation of the heart muscle or the brain and lining around the brain. Following the acute phase, most infected people enter into a prolonged asymptomatic form of disease (called “chronic indeterminate”) during which few or no parasites are found in the blood. During this time, most people are unaware of their infection. Many people may remain asymptomatic for life and never develop Chagas-related symptoms. However, an estimated 20 – 30% of infected people will develop debilitating and sometimes life-threatening medical problems over the course of their lives. In people who have suppressed immune systems (for example, due to AIDS or chemotherapy), Chagas disease can reactivate with parasites found in the circulating blood. This occurrence can potentially cause severe disease. 1. Fearon MA, Scalia V, Huang M, et al. A case of vertical transmission of Chagas disease contracted via blood transfusion in Canada. Can J Infect Dis Med Microbiol 2013;24:32-4. 2. Mongeau-Martin G, Ndao M, Libman M, et al. A family cluster of Chagas disease detected through selective screening of blood: a case report and brief review. Can J Infect Dis Med Microbiol 2015;26:157-61. The U.S. FDA today granted accelerated approval to benznidazole for use in children ages 2 to 12 years old with Chagas disease — the first treatment approved in the United States for the treatment of Chagas disease. The call came from the WHO Director-General in May 2016 for a renewed attack on the global spread of vector-borne diseases. Dr Chan noted that the spread of Zika virus disease, the resurgence of dengue, and the emerging threat from chikungunya were the result of weak mosquito control policies from the 1970s. It was during that decade that funding and efforts for vector control were greatly reduced. Dr Ana Carolina Silva Santelli has witnessed this first-hand. As former head of the programme for malaria, dengue, Zika and chikungunya with Brazil’s Ministry of Health, she saw vector-control efforts wane over her 13 years there. Equipment such as spraying machines, supplies such as insecticides and personnel such as entomologists were not replaced as needed. “Vector control has not been a priority,” she said. Today more than 80% of the world’s population is at risk of vector-borne disease, with half at risk of two or more diseases. Mosquitoes can transmit, among other diseases, malaria, lymphatic filariasis, Japanese encephalitis and West Nile; flies can transmit onchocerciasis, leishmaniasis and human African trypanosomiasis (sleeping sickness); and bugs or ticks can transmit Chagas disease, Lyme disease and encephalitis. Together, the major vector-borne diseases kill more than 700 000 people each year, with populations in poverty-stricken tropical and subtropical areas at highest risk. Other vector-borne diseases, such as tick-borne encephalitis, are of increasing concern in temperate regions. Rapid unplanned urbanization, massive increases in international travel and trade, altered agricultural practices and other environmental changes are fuelling the spread of vectors worldwide, putting more and more people at risk. Malnourished people and those with weakened immunity are especially susceptible. Over the past year, WHO has spearheaded a new strategic approach to reprioritize vector control. The Global Malaria Programme and the Department of Control of Neglected Tropical Diseases – along with the Special Programme for Research and Training in Tropical Diseases, have led a broad consultation tapping into the experience of ministries of health and technical experts. The process was steered by a group of eminent scientists and public health experts led by Dr Santelli and Professor Thomas Scott from the Department of Entomology and Nematology at the University of California, Davis and resulted in the Global Vector Control Response (GVCR) 2017–2030. At its Seventieth session, the World Health Assembly unanimously welcomed the proposed response. Scaling-up vector-control tools and using them in combination to maximize impact on disease while minimizing impact on the environment. Specifically, the new integrated approach calls for national programmes to be realigned so that public health workers can focus on the complete spectrum of relevant vectors and thereby control all of the diseases they cause. Recognizing that efforts must be adapted to local needs and sustained, the success of the response will depend on the ability of countries to strengthen their vector-control programmes with financial resources and staff. The GVCR also calls for the aggressive pursuit of promising novel interventions such as devising new insecticides; creating spatial repellents and odour-baited traps; improving house screening; pursuing development of a common bacterium that stops viruses from replicating inside mosquitoes; and modifying the genes of male mosquitoes so that their offspring die early. An entomologist inserts live mosquitoes into a standard ‘cone bioassay’. After 30 minutes he will see how many have been killed – this will measure if the insecticide was sprayed properly on the walls, and constitutes intervention monitoring. The call for a more coherent and holistic approach to vector control does not diminish the considerable advances made against individual vector-borne diseases. Malaria is a prime example. Over the past 15 years, its incidence in sub-Saharan Africa has been cut by 45% – primarily due to the massive use of insecticide-treated bed nets and spraying of residual insecticides inside houses. But that success has had a down side. The GVCR calls for countries to invest in a vector-control workforce trained in public health entomology and empowered in health care responses. “We now need more nuanced control – not one-size-fits-all, but to tailor control to local conditions,” Professor Lindsay said. This is needed to tackle new and emerging diseases, but also to push towards elimination of others such as malaria, he said. Dr Lindsay noted that, under the new strategic approach, individual diseases such as Zika, dengue and chikungunya will no longer be considered as separate threats. “What this represents is not three different diseases, but one mosquito – Aedes aegypti,” said Professor Lindsay. The GVCR will also help countries achieve at least 6 of the 17 Sustainable Development Goals. Of direct relevance are goal 3 on good health and well-being, goal 6 on clean water and sanitation, and goal 11 on sustainable cities and communities. The GVCR goals are ambitious – to reduce mortality from vector-borne diseases by at least 75% and incidence by at least 60% by 2030 – and to prevent epidemics in all countries. The annual price tag is US$ 330 million globally, or about 5 cents per person – for workforce, coordination and surveillance costs. This is a modest additional investment in relation to insecticide-treated nets, indoor sprays and community-based activities, which usually exceed US$ 1 per person protected per year. It also represents less than 10% of what is currently spent each year on strategies to control vectors that spread malaria, dengue and Chagas disease alone. Ultimately, the shift in focus to integrated and locally adapted vector control will save money. Dr Santelli expressed optimism that the GVCR will help ministries of health around the world gain support from their governments for a renewed focus on vector control. “Most of all, this document is a call for action,” said Dr Santelli, who now serves as deputy director for epidemiology in the Brasilia office of the U.S. Centers for Disease Control and Prevention. It will not be easy, she predicts. The work to integrate vector-control efforts across different diseases will require more equipment, more people and more money as well as a change in mentality. “The risk of inaction is greater,” said Dr Santelli, “given the growing number of emerging disease threats.” The potential impact of the GVCR is immense: to put in place new strategies that will reduce overall burden and, in some places, even eliminate these diseases once and for all. Chagas disease (Trypanosoma cruzi infection) is the leading cause of non-ischemic dilated cardiomyopathy in Latin America. Texas, particularly the southern region, has compounding factors that could contribute to T. cruzi transmission; however, epidemiologic studies are lacking. The aim of this study was to ascertain the prevalence of T. cruzi in three different mammalian species (coyotes, stray domestic dogs, and humans) and vectors (Triatoma species) to understand the burden of Chagas disease among sylvatic, peridomestic, and domestic cycles. To determine prevalence of infection, we tested sera from coyotes, stray domestic dogs housed in public shelters, and residents participating in related research studies and found 8%, 3.8%, and 0.36% positive for T. cruzi, respectively. PCR was used to determine the prevalence of T. cruzi DNA in vectors collected in peridomestic locations in the region, with 56.5% testing positive for the parasite, further confirming risk of transmission in the region. Our findings contribute to the growing body of evidence for autochthonous Chagas disease transmission in south Texas. Considering this region has a population of 1.3 million, and up to 30% of T. cruzi infected individuals developing severe cardiac disease, it is imperative that we identify high risk groups for surveillance and treatment purposes.